Last week I told you about the upcoming Paper Flower Arrangement Workshop that I am hosting at The Paper Place in Toronto. I now have the details for you all! The Paper Flower Arrangement Workshop will be held on July 19th from 6:30 pm to 8:30 pm. We will be making 2 types of paper flowers, an open-face peony and a carnation, along with basic greenery leaves. At the end of the workshop, you will take home a small flower arrangement, similar to the one you see in the photo above! All materials are included. Cost per person is $65 plus HST. You may register in person at The Paper Place (887 Queen Street West, Toronto) or by telephone (416-703-0089) with a credit card. Other details can be found at www.thepaperplace.ca or via Instagram (@thepaperplace). You can contact me or The Paper Place directly if you have any questions about the workshop. I look forward to seeing some of you at the workshop! It’s going to be AWESOME and you won’t want to miss it!!! 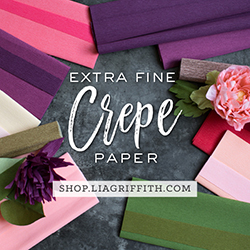 Disclaimer: I am not affiliated with The Paper Place, however, as the instructor of the Paper Flower Arrangement Workshop on July 19th, there is an instructor fee and I will be remunerated through a portion of the fees paid by each student to participate in this workshop.